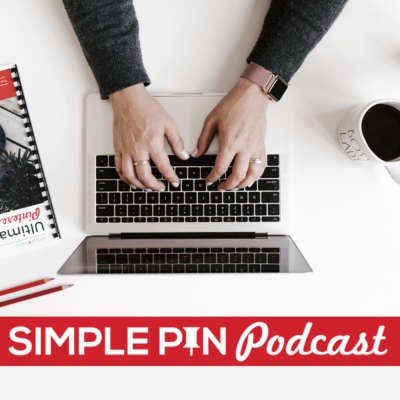 The Simple Pin Podcast is a show dedicated to using Pinterest to boost your business. I interview people using Pinterest in creative ways to build their email list and increase revenue. In addition, I’ll bring you the latest updates, trends, and tips for maximizing your efforts without wasting your time. No crazy hacks to ‘game the system’ just solid advice you can use to grow your Pinterest presence. Leave a review on Apple Podcast! Open iTunes, go to the Store, and search “The Simple Pin Podcast.” Then click on ‘Ratings & Reviews,’ and click the button that says ‘Write a Review.’ Thanks! Get SPM’s Weekly Pinterest Insider Tips! We’ll never spam, pinky promise! Going into Pinterest with a strategy, rather than just hoping for a pin to go viral, made it SO much better, and provided me with faith in my own work. The majority of traffic comes from Pinterest! It’s so awesome! Really! I can’t thank you enough! I’ve been blogging since winter 2015 and it feels so good to see some results. Thank you so so so much! Do Followers Matter on Pinterest? Celebrating 100 Simple Pin Podcast Episodes! Manual Pinning vs. Scheduled Pinning: Which One Gets Better Results? Pinterest Marketing Courses: Are They Worth It? Pageviews vs. Income: Which one Matters Most? Do Pinterest Follower Numbers Affect Page Views? Does Pinterest Make You Happy?